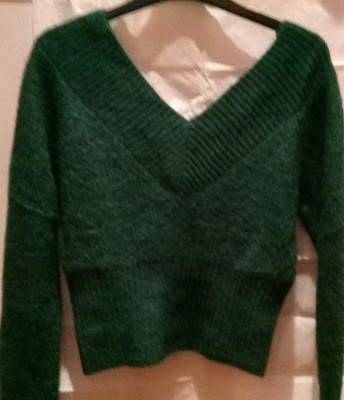 a green jumper but this time it is something different from the classic round neck or polo neck. I found it at H&M in their Divided section. Made in a soft Acrylic/Wool/Alpaca mix, it has a wide, ribbed v-neck at both the front and back, with the 'v' not so low at the back. I love the neckline, which is ideal for this season's jewellery trends - either a single gold chain with a gold medallion pendant or layered little gold chain necklaces. They don't have to be real gold and there is a good selection of these styles in the high street. Actually, both H&M and Primark have really picked up on medallions! (I must mention my medallion earrings, which came from a Primark 6-pack of 'gold' earrings). In my next post, coming soon - some more green and gold and some red too!